Last month I was again commissioned to paint for another 1:24 scale dolls house. The brief for this commission was to paint four miniature pictures to go in a 1:24 country cottage style dolls house in Scotland. The lady has said she will leave it up to me, so I had fun painting two rose vases and two country landscapes. 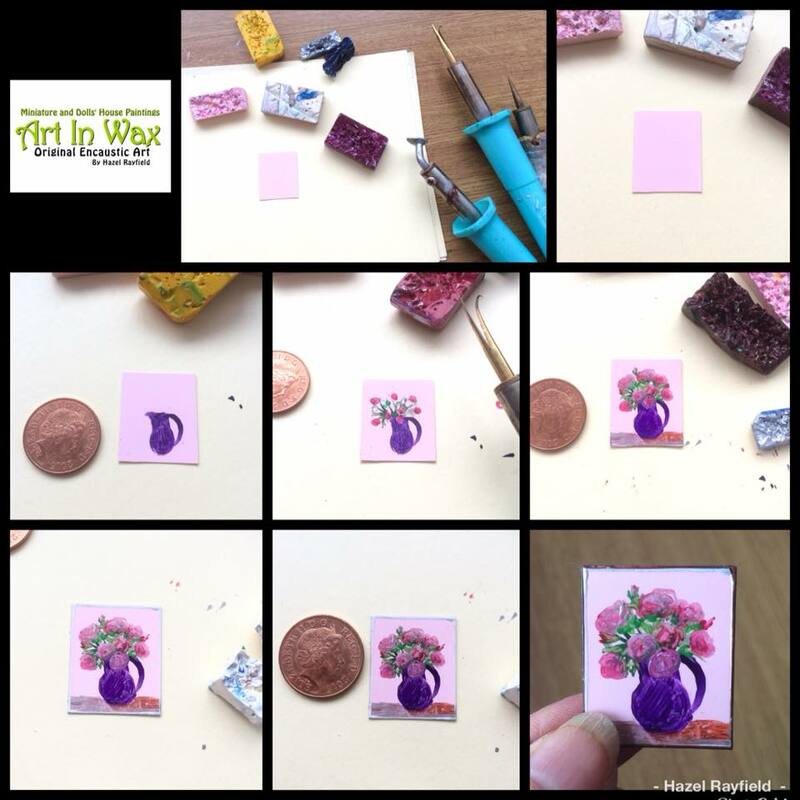 Starting with my encaustic tools and wax on a pink specialist encaustic card ….. I then painted the vase / jug in a purple wax, adding then the greenery and areas where the main flowers will go. Adding highlights and shadow plus a table for the vase to sit on and finally a silver and brown edge, this piece is just 1 x 1 1/4 inches. More new 1:24 scale dolls house art ….. The paintings shown in this image are all sold but if you see a piece that is sold and would like one similar…. why not …. How it works ….. Commissioning Hazel Rayfield. All Original Art In Wax – if you would like a special picture just for you. In my style naturally I don’t do copies / reproductions. 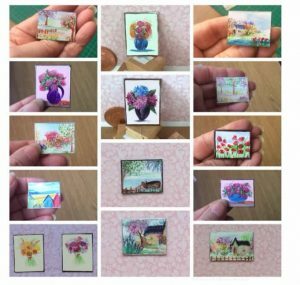 We can then discuss your requirements and I can start painting a piece of miniature art just for you.